A lot of students are tired of finding the MDCAT past papers on the internet especially the 2018 version, but when they download, it is 2017 only. But I have got the 2018 version in the below PDF. But here you can download with a single click and print whenever you want. It is worth mentioning that MDCAT was previously called MCAT. MCAT stands for Medical College Admission Text, but MDCAT stands for Medical and Dental College Admission Text. Answer keys are given so that you don't need to find the answers on the internet. You already know that MDCAT is considered the most difficult entry test in Pakistan because more than 50,000 students take the test every year and almost only 3,500 clear the test and get admission in government medical colleges. So, the pass percentage for MDCAT is only 8%, but don't worry, you have to fight for only one seat. Just hard work and focus on your goal and aim for getting only one seat. I know what you're thinking, MBBS in China has no value and it's expensive, but you're wrong. You can read above article where all your questions are answered. The questions were asked from a student, Syed M. Musa Rizvi, who is doing MBBS in China from Xinxiang Medical University. Below is the link of the past papers of MDCAT that were taken from 2008 to 2018. You can download directly the PDF or view online. If you hate downloading anything, then this online version is for you. Click it to read the PDF in the full screen. It's shown at the bottom of the PDF. To read in HD, view in full screen or download. You will see observe many MCQs are repeated every year. They can be the same MCQs and with little modifications. You come to realize your weakness and strengths on different topics and areas. Some students just keep memorizing now stuff, but don't practice because they hate doing it. If you're among them, change your attitude. You will see observe many MCQs are repeated, you don't only need to see the repeated rather you have to check the difficulty level of the MCQs so that you can prepare for the MCQs, and you understand the psychology why the MCQs are repeated. 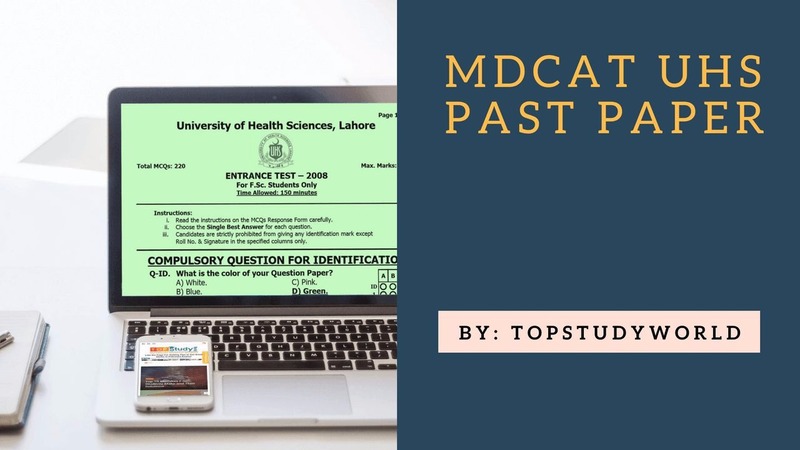 Here you can download directly in PDF all the past papers of UHS MDCAT (MCAT) taken from 2008 to 2017 with answer keys, and you can print too.